Today, virtualization has become a familiar sound bite within the lexicon of innovation in the business world. Organizations understand the benefits of upgrading and migrating their applications to the virtual environment and the unique services and increased business agility this offers. However, migrating to virtual environments presents a number of challenges requiring the right expertise. 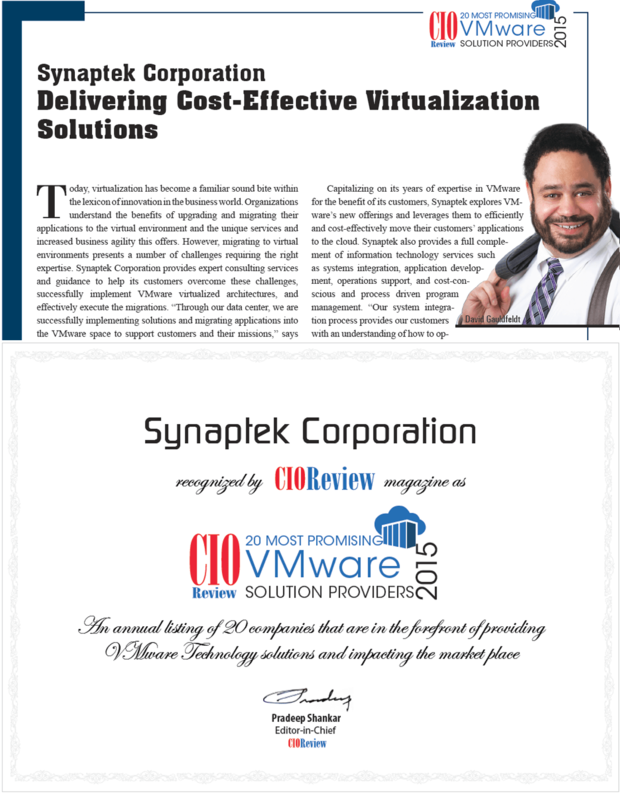 TekSynap (formerly Synaptek Corporation) provides expert consulting services and guidance to help its customers overcome these challenges, successfully implement VMware virtualized architectures, and effectively execute the migrations. “Through our data center, we are successfully implementing solutions and migrating applications into the VMware space to support customers and their missions,” says David Gauldfeldt, President of TekSynap (formerly Synaptek Corporation). TekSynap, based in Reston, VA, supports virtualized environments on VMware platforms including versions 5.x and 6.x. TekSynap uses multiple ESXi 5.5 hosts in a highly available configuration within their datacenter and lab. Additionally, TekSynap utilizes VMware vCenter server 5.5, vRealize Operation Manager 6.0, vSphere Data Protection 5.8, and Site Recovery Manager to cost-effectively meet customer requirements. These virtualized products demonstrate to customers the private, hybrid, and public cloud opportunities and advantages to help them overcome their own datacenter pain points and reduce overall OpEx and CapEx costs. TekSynap also deploys virtual machine templates for Microsoft Windows servers and workstations, as well as Linux-based appliances. “Our status as trusted VMware solutions provider partner has yielded substantial benefits for our customers, as we can provide comprehensive product licensing to help them meet enterprise business needs,” says Gauldfeldt. Capitalizing on its years of expertise in VMware for the benefit of its customers, TekSynap explores VMware’s new offerings and leverages them to efficiently and cost-effectively move their customers’ applications to the cloud. TekSynap also provides a full complement of information technology services such as systems integration, application development, operations support, and cost-conscious and process driven program management. “Our system integration process provides our customers David Gauldfeldt with an understanding of how to optimize solutions to best serve their business needs and mission objectives,” explains Gauldfeldt. The company’s strength lies in finding the right processes for predictable performance within a continuous improvement environment that enhances and advances their capabilities. Moreover, TekSynap’s operations support model establishes high availability environments and applies best practice process frameworks from the datacenter to the service desk. “We understand our customers’ critical missions and translate the mission requirements into implementable engineering solutions,” adds Gauldfeldt.